Just confirmed that our initial information was incorrect, it's 28nm HPL (28nm low power with high-k + metal gates). The difference between HPL and HPM is a optimization for leakage vs. peak performance. This helps explain the 1.9GHz max frequency for the A15s in Tegra 4. - The fifth/companion core is also a Cortex A15, but synthesized to run at lower frequencies/voltages/power. This isn't the same G in and island of LP process that was Tegra 2/3. 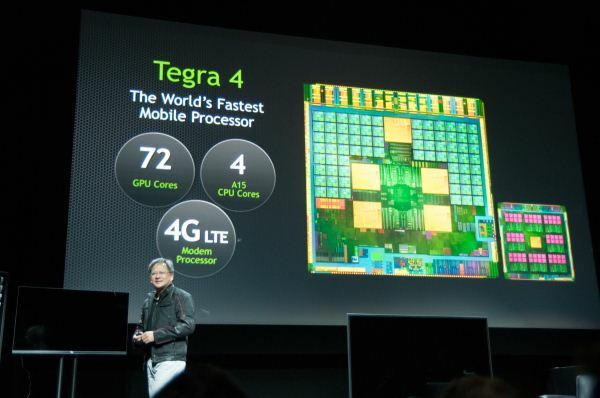 - The fifth/companion core isn't visible to the OS, it's not big.LITTLE but it'll work similarly to how Tegra 3 worked. This probably means no companion core in Windows RT. - The four Cortex A15s will run at up to 1.9GHz. - NEW: the shaders aren't unified, the majority are 20-bit pixel shader cores though. No idea on the ratio yet. - NVIDIA's i500 will launch with LTE UE Category 3 (100Mbps downlink) support, eventually we'll see an update to UE Category 4 (150Mbps downlink). - i500 will launch with carrier aggregation for WCDMA, no idea what 3GPP release.